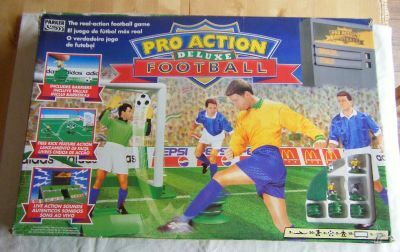 A game that had considerable backing for a while with many versions and accessories. This deluxe set is representative of the entire range. 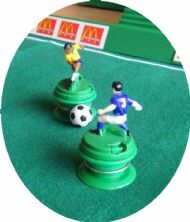 A kind of Subbuteo on wheels. 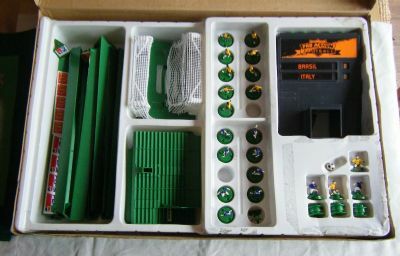 Complete set in good condition with grandstands. Lots of goodies in this set mostly to do with building the stadium. 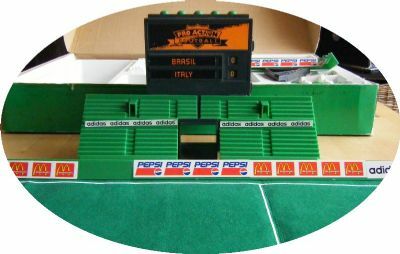 Two terraces and a scoreboard clip together to create a grandstand which has battery operated sounds of the crowd etc. The players are beautifully detailed and painted but come on HUGE bases that have a ball bearing in the base so that they can whizz around. Great figures on huge bases with metal wire around them - the ball is magnetised so it sticks to the player bases. 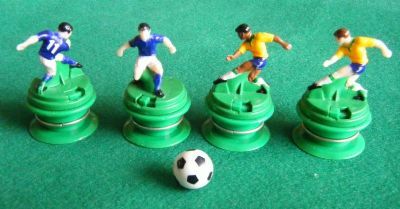 There are a huge number of club and international sides available as spare teams.